If you love giveaways, this is a sweet one! I have partnered with 20 of my blogging buddies to bring you this awesome giveaway sponsored by Melissa & Doug! 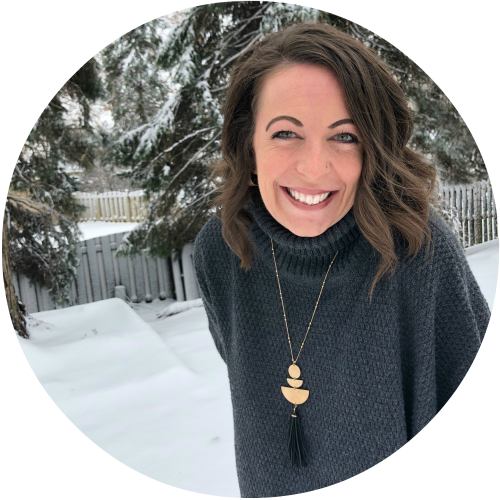 Each blogger below writes in the “kid niche area” meaning that you can click through to any blog and find inspiration for play-based educational activities, arts, and crafts that your kids are sure to love! And each one of these bloggers is as fond of Melissa & Doug as I am because they see the value in encouraging kids to learn and explore at an early age while still making it fun! 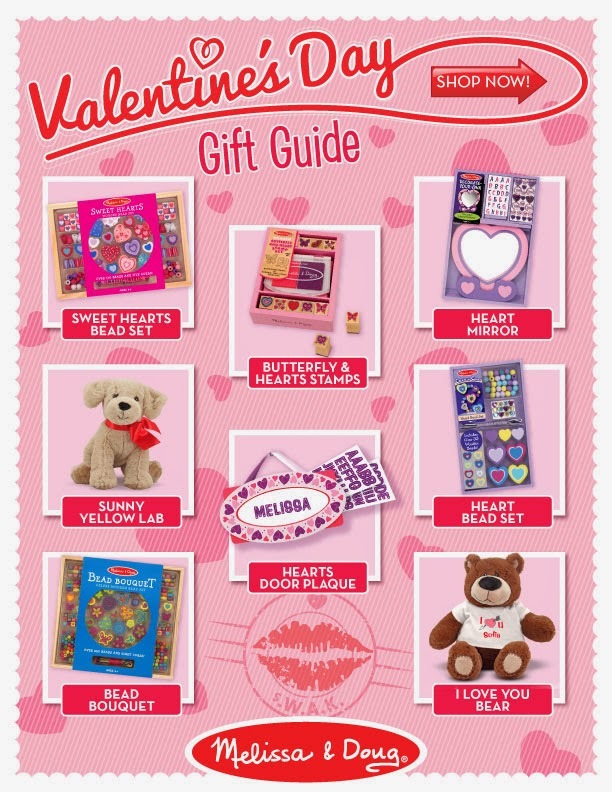 Speaking of fun… check out this awesome Melissa & Doug Valentine’s Day Gift Guide! Can you believe they are allowing us to give away 3 complete sets of these wonderful toys? YES… each winner gets ALL the items shown in the Gift Guide! Each Valentine’s Gift Guide Set includes over $90 worth of toys and crafts! Decorate-Your-Own Wooden Heart Box with FREE Personalization!! I Love You Bear with FREE Personalization!! We have a love for all things Melissa & Doug at our house. With 3 boys (ages 5, 3 1/2, and 19-months), Melissa & Doug educational toys are a developmental staple in this house! I am drooling over the Sweet Hearts Bead Set… adorable! And one of our favorite things are Melissa & Doug stamp sets! PLUS… I love the fact that most of these gifts are not only fun and crafty, but also help your young ones work on their fine motor skills! Okay, okay… on to the giveaway! 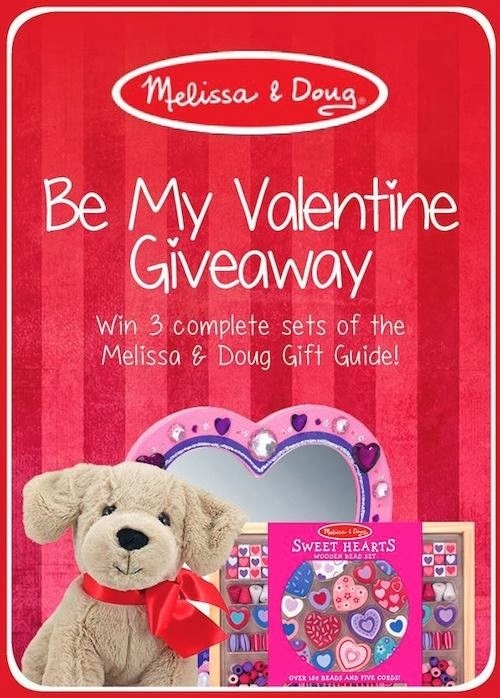 Enter for a chance to win one of 3 Full Sets of EVERYTHING on the Melissa & Doug Valentine’s Day Gift Guide! The giveaway is open to US Residents only and closes at midnight on Friday, February 14, 2014. Complete as many entry options as you like! Hint: If you finish the first entry option below, it will unlock a second set of entry options! Your chances of winning go up dramatically the more entries you get in the hat! Makeovers & Motherhood received no compensation for sponsoring this event, nor is she responsible for the delivery of the prize. Prize delivery is the sole responsibility of Melissa & Doug, LLC. Three winners will be drawn randomly and notified by email. The winners will have 48 hours to respond in order to claim their prize. If they do not respond within the 48 hours, they will forfeit the prize and an alternate winner will be chosen. This post may contain affiliate links. For more info, please see this disclaimer page.